Big Tuna~ Ultimate Family Vacation Destination With Premium Amenities! BOOK NOW !!! Big Tuna | Villages of Crystal Beach-Don`t miss the BEST CATCH IN DESTIN!!! 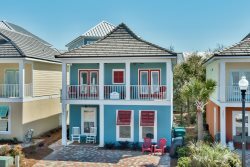 BeachNut - Centrally Located, Coastal Furnishings, 4 Bedrooms 3.5 Baths, 2 Living areas and 2 Master suites!!! Property Size 1,958 sq. ft.
Don't miss the BEST CATCH IN DESTIN!!! This is an absolutely adorable home in The Villages of Crystal Beach. Brand New, just built and completed in Winter of 2013 With all new furnishings and all of the latest greatest in furnishings and electronics! Perfectly suited for a great family vacation with baby gear and baby gates... we even have a baby bed!!! This home is located just a few steps from the huge Lagoon Pool and hot Tub. You can enjoy lush landscaping all around and surround sound music playing all day. Sit and relax around the expansive pool and the Tiki Hut area has comfy seating and a Plasma TV. Waterfalls, Island in Center of pool and Hot Tub complete this one of a kind amenity area in Destin. Perfect for chilling with your family and friends! Just 2.5 blocks from our home you will find the most beautiful white sands and crystal clear Emerald Green waters of Crystal Beach. Seasonally trolley will transport you there in a flash, or you can take a short 5 minute stroll on down. Right outside the north gate are tons of shops, Restaurants, grocery shopping, and so much more. there are numerous golf courses within 1-5 miles. Oversized master bedroom #1 is on the first floor with a king bed. Master bath #1 has a shower, garden tub, double sinks and walk in closet. Living room, powder room, dining and Kitchen are on the first floor as well. Walk upstairs to the bonus area for an extra living space with a futon sleeper and walk out to the porch. Master Bedroom #2 on second floor has king bed and full bath. Bedroom #3 has a queen bed and walk out porch and the 4th bedroom has twin over twin bunk, full over full bunk bed and baby bed. This property is pet friendly with an additional fee DOGS only and the breed must be approved by the manager. $100 PET FEE PER DOG. 2 LIMIT. This is the perfect home for you and your family to make unforgettable, lifetime memories! All the comforts of home and more. Baby bed, high chair and baby gates at the stairs make this a very safe family environment. The best TV's with HD in every room including both living areas, fully equipped kitchen and comfy linens make this 5 star home one you won't soon forget. Guests of Destin Comforts enjoy discount golf, water sports, deep sea fishing, water park and more. Pool bands must be worn at all times, they are in the house. There is a $25.00 Fee for lost or non returned Pool Bands.